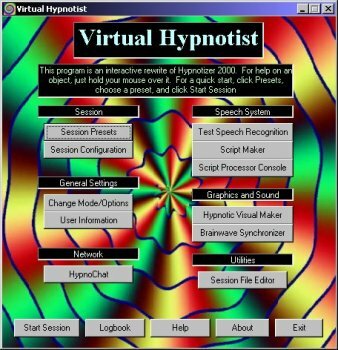 Virtual Hypnotist is a free, open source, interactive hypnosis program. It includes features such as voice recognition, speech synthesis, subliminal messages, completely customizable scripts (featuring a unique scripting language), videos, audio, and lots more. Its purpose is to simulate a real hypnosis session as much as possible. Downloaded Virtual Hypnotist and used ti ti hypnotize myself immediately. Where can I find the actual wording on the scripts? Pretty nice peace of software. I've been a practicing hypnotist for over 5 years now. I primarily do comedy and nightclub shows, but will sometimes sponser a "weight-loss" or "stop-smoking" seminar from time to time. I've tested this software package fro the last 3 months now, and I've had outstanding results with it. I've found it works well when I'm flying or traveling. I simply turn on my laptop, plug in my headset, and run the software. I use it for relaxation, concentration and focus, and confidence and motivation sessions. It'a tool like any other. There are no perfect tools, so don't expect this one to answer all your prayers. But it does do what it says it will do. And it does it well. I have recommended it to several clients and friends. Enjoy the gift that is being offered. All negative posters should get some hypnotherapy and improve their self image and be more positive towards life. Remember...tomorrow you die...now what are you going to do with the time left?!?! This release wasn't supposed to be submitted to Betanews, mainly because it requires 5.2 to be installed in order for it to work at all (that's why the previous person complained haha; I did this in order to keep it small, and it was mainly just intended for members of the program's Yahoo group). I don't know who submitted it. Installed this and on first run it just gave a bunch of errors and wouldn't close until I used Endtask. I then reinstalled it got the same problem again. The creator really needs to go back to the board on this one. I however do like the idea. Virtual Hypnotist is the best and most flexible self-hypnosis program ever. No one would say that it is the best possible program, but I would venture to say that it now represents the arrival of software that can be used seriously---maybe WordPerfect would be a good analogy. The negative reviews here reflect (1)ignorance of hypnosis: if you are not awakened from hypnosis by the hypnotist---in this case, VH---you either fall asleep or wake up by yourself; except in 19th-century horror stories, no one has ever been "stuck" in hypnosis (though many do remain stuck in ignorance); or (2) the misperception---which would seem to indicate very little time spent with the program before writing a review---that the speech synthesis is part of the program itself. It should be obvious to anyone that VH uses various other applications to do what it does, and being freeware itself, it has to rely on other freeware. Freeware speech synthesis is not that well developed---even the AT&T voices that you have to pay upwards of 30 dollars each for are not that great! It takes work---but quite acceptable results can be generated (I tend to prefer the British voices myself). As to the many bugs, mostly minor, found in earlier versions, most that I'm aware of have been fixed in the latest release, version 5.2. The most significant lack that needs to be remedied is the sameness of many of the scripts. But I believe that the program now has reached a stage where it will begin to inspire people to fill that gap. So who is going to you wake you up, once this peculiar program has hypnotized you?????????? The mere idea of using a computer to hypnotize people is dangerous and sick. As for hkm's comment, I don't ask for money (the program's open-source). Also you don't seem to know what you're talking about either haha (your comments don't even make any sense). Program with great potential, but still to young for mainstream. The idea is great, but it has bugs all over, interface is sloppy, speech recognition and the audio interface need some adjustment. Feels like a robot is telling me to go to sleep (not happening)a smoother voice should be added. A user friendly interface and a better audio(voice) engine should put this program on the road. Horrible & ug-lee! Gee, I wonder if "bwaySteve" could mebbe be the prog author? If not, then a successfully hypnotized prog user. The program had a nice concept and might have even worked if not for the HORRIBLE voice synth program. It sounds like your trying to be hypnotized by a robot. It's distracting and makes it impossible to concentrate on relaxing, which is the whole point of hypnosis. Sorry guys it was a nice idea but it simply does NOT work. Froze my computer for about 4 minutes during install, followed by an error. Then the program tried to start an windows had a critical error with the speak software. It installed an awful lot of files for what it is supposed to do. This versoin is even better - and the program so versitile it just gets to be more and more fun and effective all the time!